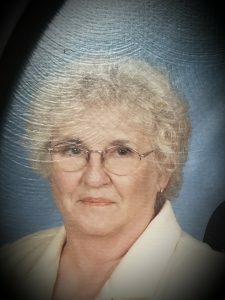 Sedan – LaDonna HannaJane Smith, age 87, of Sedan, passed away Tuesday, August 14, 2018 at her home in Sedan, Kansas. She was born February 27, 1931 to Carl Ford and Gladys (Koch) Ford in Herington, Kansas. They moved to Fredonia where she attended school until they moved to Wichita where she graduated from East High School. On July 10, 1949 she married Evertt Leon Smith in Wichita, Kansas. They were relocated to California for three years while Leon was serving in the United States Air Force. They moved to Winfield where Leon was beginning his career as an automobile mechanic and then moved to Eureka for a short time. They moved to Sedan in 1960 where they owned and operated a mechanic shop and LaDonna worked at Floyd’s Supermarket. She worked for 32 years until her retirement in early 1990’s. LaDonna was a member of the First Christian Church in Sedan, she enjoyed cooking, sewing, computers, and lastly, loved spending time with her family. LaDonna is survived by three sons; Dennis Smith and wife YuIn of Newport News, Virginia, Steve Smith of Sedan, Kansas, and Mike Smith and wife Nancy of Webb City, Missouri; two daughters; Charlene Burns of rural Peru, Kansas and Teresa Pape and husband Gragg of Stillwater, Oklahoma; one sister, Marlene Brazell of Augusta, Kansas; 13 grandchildren, 16 great-grandchildren, and 2 great-great-grandchildren. LaDonna was preceded in death by her husband Evertt Leon Smith; two sisters, ElDoris (Polly) Cheuvront and Fran Ledbetter and her parents. A Celebration of Life Service will be held on Saturday, August 18, 2018 at 11:30 a.m. at the First Christian Church in Sedan, with Pastor Penny Goldberg officiating. Inurnment will follow at the Greenwood Cemetery in Sedan. The family has suggested a memorial to the First Christian Church of Sedan and those remembrances can be left in care of the Dickens Family Funeral Home, 209 N. Douglas, Sedan, Kansas 67361. La Donna and I became friends in the mid-1930's. We lived just across the alley from the Ford family, in Fredonia, KS. La Donna, Martha and I all attended Kindergarten together. My mother was the teacher and we had class at a church in the same block as where the Ford's lived. La Donna kept in touch with me all thru the years and was such a special person and friend. I was there when she and Leon got married. Her sister Polly lived a few blocks from me, here in Denver, for many years. We also were good friends and attended the same church. My heart goes out to La Donna's family and I send my deepest sympathy to each of them. You were so fortunate to have such a wonderful person to guide you thru life. Love to you all, Jorita. May the peace of our Lord be with you all !! LaDonna was always a special Aunt and always came to Denver to visit my family and her sister Polly. We always had a fun time, she will be missed.